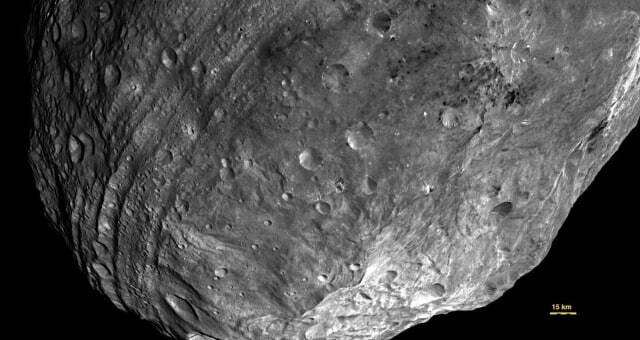 Vesta used to be round — until it got hit by something nearly one-tenth its size. The resulting impact basin, named Rheasilvia, fills most of this image, taken by NASA's Dawn spacecraft from about 3,200 miles (5,200 kilometers) away. Vesta’s south pole lies in the mountains at lower right, while the parallel grooves at left (also created by the impact) run roughly along the equator.